Wisconsin is best known for a few things. It’s a historic state for the brewing industry (heck, the Milwaukee baseball team is even called the Brewers) and it’s blanketed with dairy farms. To say the people of Wisconsin love cheese is the understatement of the century. They love cheese so much that fans of the Green Bay Packers are even referred to as ‘cheeseheads.’ But, how much cheese is too much cheese even for a state obsessed with it? Well, Burger King is about to find out. That’s because the world-famous burger chain is releasing a special Whopper to honor Wisconsin and it’s cheesier than Gallagher opening for Carrot Top. 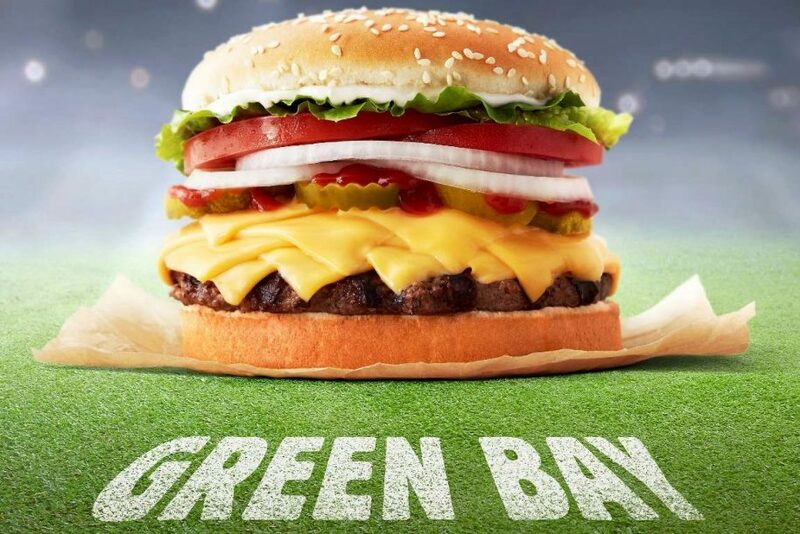 They’re calling it the Green Bay Whopper. While that sounds fairly unassuming, just know this isn’t your average Whopper. It starts off as a regular Whopper, but instead of the usual number of cheese slices, this sandwich has a ridiculous eight slices. You read that right, eight slices of American cheese. We’ve already insisted that Wisconsin loves dairy, but even for fans of deep-fried cheese, this is cheese overload. The sandwich will set you back $4.99 and is available now until Dec. 2. Sadly, if you’re some kind of cheese-a-holic, you’ll have to take a road trip to Wisconsin to enjoy this insane burger. That’s because it’s currently only available at six locations in the Green Bay area. One of the locations is less than a mile away from Lambeau Field. If you’re planning on attending the game this weekend against the Arizona Cardinals, why not stop into BK before to stock up on Green Bay Whoppers? You’ll surely be the hit of the tailgate.